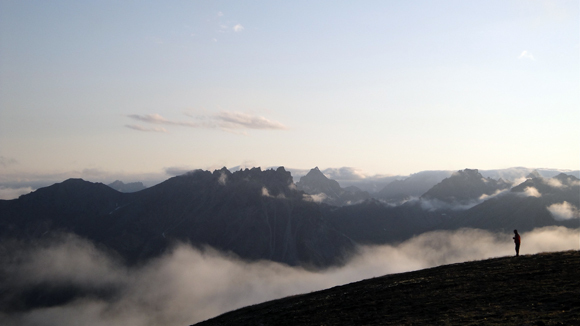 David Sunderlin has a special connection to Alaska, one that dates back 55 million years. The associate professor of geology studies fossil leaves and wood caught in the sedimentary record of Alaska’s Matanuska Valley with the hopes of contextualizing the environment of the past with the future. The fossils he and his student researchers study are from the end of the Paleocene Epoch and the beginning of the Eocene Epoch, a time when the global climate was the warmest it has been since the demise of the dinosaurs. His research group has shown that the climate of Alaska at that time seems to be much like modern Virginia, or the Carolinas. Jaclyn White ’13 inspects a piece of petrified wood. 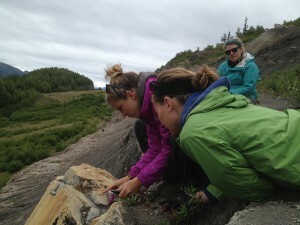 Geology graduates Jaclyn White ’13 and Alexandria Brannick ’12 spent the summer of 2011 in the field with Sunderlin in Alaska through Lafayette’s EXCEL Scholars undergraduate research program. White worked on reconstructing the paleoclimate using the fossil leaves and wood, and Brannick studied the paleoecology of plant/insect interactions. Brannick, who is working on her Ph.D. at the University of Washington, wrote her senior thesis about her fieldwork in Alaska. White also ventured to Alaska in the summer of 2012. She and other students reconstructed environmental parameters preserved in the Chickaloon and Arkose Ridge formations by collecting fossilized trees and comparing their rings to modern redwoods. As is typical with a liberal arts education, the students learned much more from Sunderlin than just the subject of the research. 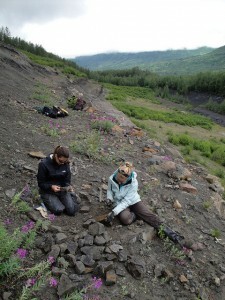 Alexandria Brannick ’12, left, sorts fossil leaves from Alaska’s Chickaloon Formation. Sunderlin’s current research assistant, geology major and EXCEL Scholar George Tillery ’17 (Tucson, Ariz.), is going to use a new form of measurement that will take silhouettes of the fossilized Alaskan leaves to understand how much rain fell there during the Paleocene/Eocene. Although he won’t be going to Alaska this summer, Tillery will accompany Sunderlin in some “reconnaissance paleontology” in northern New Mexico. Sunderlin’s hope is that trip will be a precursor to a multi-season project focused on paleo-temperature and paleo-precipitation of the region during this major “greenhouse climate phase” in the late Paleocene/early Eocene epochs.